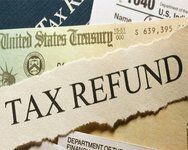 Which account should an income tax refund go to on the Chart of Accounts? Thank you for your question about which account an income tax refund should be categorized to on the Chart of Accounts. If you are a sole proprietor and are receiving an income tax refund that you are depositing into the business, it would go into the Owners Contribution (equity) account.